Home / Aesthetic Clinic / Is a High Number SPF Better than a Low Number One? We all want to avoid looking old with sun-damaged skin, so we use sunscreen that has higher SPF, thinking that it is better at sun protection than one with a lower SPF. Unfortunately, that widespread assumption is wrong. Sun protection factor (SPF) is a measure of how long a sunscreen delays sunburn. So if someone would ordinarily get sun burn after 15 minutes of exposure, a sunscreen with SPF 15 would protect that person’s skin 15 times more (around 225 minutes) than if that person had gone without any sunscreen. Erroneously, we use that same logic for higher SPF and assume that a sunscreen with SPF 50 would protect our skin 50 times longer so we avoid aging skin caused by sun damage. According to the United States Food and Drug Administration, that is not exactly the case, and it has in fact taken steps to curb misleading advertisements on sunscreen labelling (forcing marketers to label sunscreen as SPF 50+ if they go higher than that threshold). Without using marketing jargon, SPF 15 already keeps out about 93% of all incoming UVB rays, although a skin care specialist like Dr. Sylvia Ramirez might recommend using SPF 30. As the medical director of an anti-aging clinic in Singapore, she has developed her own line of sun defense products such as the Oil Free Sun Protection SPF30. At this level, already 97% of sun- burning rays are filtered out. As the SPF number increases, such as SPF 50, the level of sun protection a person gets only marginally increases. (At SPF 50, only 98% of UVB rays are blocked.) This means that SPF 100 doesn’t necessarily filter out 100% of UVB rays; no sunscreen could ever do. The danger of believing that a higher SPF equals stronger protection gives consumers a false sense of security. Since many users mistakenly believe that a sunscreen with SPF 100 would give them 100 times the protection, they consequently stay out in the sun far longer than what is considered safe. The result: sunburn or worse, a heat stroke. Using sunscreen that has very high SPF may also cause those with sensitive skin to breakout. This is because some of the ingredients in a SPF 50+ sunscreen are far too harsh for acne-prone skin. SPF is just one element of adequate sun protection. A sunscreen with SPF protects users against UVB or burning rays only. 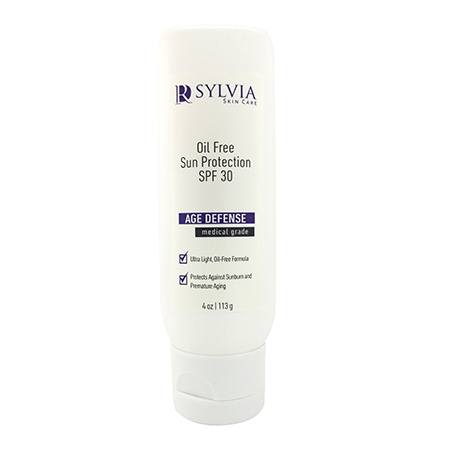 SPF does not provide adequate protection against UVA rays. For sunscreen to block UVA or aging rays, it has to be labeled broad spectrum. Dermatologists say that what actually matters when it comes to sun protection is not just the SPF number and the broad spectrum label, but also the amount applied to the exposed area and the regularity of application. As a leading female dermatologist in Singapore, Dr. Sylvia Ramirez suggests that you apply Oil Free Sun Protection SPF30 at least 30 minutes prior, and reapply Sunscreen Spray SPF29 every 2 hours especially on exposed areas that are hard to reach. The American Academy of Dermatology says one ounce, or a shot glass, of sunscreen is required to cover any exposed area of the body, which should be adjusted according to body size. This is because in laboratory testing, that is the amount used to achieve the SPF ratings that you see on the label.